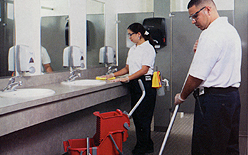 General cleaners, Green Programs, floor care products, disinfectants, janitorial equipment, entrance matting, plastic garbage liners, hand soap systems, hands free dispensers, paper towels, toilet tissue, mops, garbage cans, bathroom partitions, vacuums, floor polishers, pressure washers, disposable washcloths, laundry chemicals, kitchen sanitation products and systems, odor control products and other miscellaneous products - Please ask! major brands of Jan/San equipment. Nassau County, Suffolk County, Queens, Bronx, Brooklyn, Manhattan, Staten Island, Westchester County and Northern NJ. This area is covered by an expert sales force. in the most professional manner at all times.